An app to introduce the most comprehensive range of products launched in the company’s history. An easy to use reference guide to a new product range, which could be used by both customers and sales teams. To serve the biggest number of sales representatives, engineers in the field and purchasing managers, the application was developed natively for iOS, Android and web. All of these are controlled and updated from a single back office, and updates could be pushed out, meaning users always had the latest information available as the product evolved in the period after launch. Swipe through full drive range, and delve deeper into each set of product information. If the user has specific requirements and is new to the range, they can search for specific parameters or the application they are looking for, to compare matching drives. Location data or inputted postcode can be used to show the user their nearest distributor, and give them a direct way of contacted sales and support. Through wireframing and discussion, an app specifically aimed at industrial automation engineers was created to inform them of a new product range. Features included searching by specification, product comparison and interactive mapping of Drive Centers and Distributors. As project manager, my role was to visit and select a development house, create wireframes and discuss these with the team, whilst taking responsibility for budget and delivery. An engaging experience to bring the new product range to life in a realistic setting. The app was used as a method of attracting interest to our exhibition stand, and targets that triggered the augmented reality were provided so visitors could take the experience home with them. 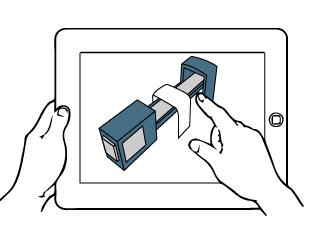 The key feature of the app was to give a realistic application scene, allowing the user to explore each drive in a typical manufacturing setting. As technical lead on this project, I brought my expertise in web and mobile technologies, a keen eye for user experience and a practical knowledge of the hardware, leading me to travel to Nuremberg, Germany to run the app at the exhibition where the Unidrive M products were being launched. Demonstrating the core benefits of the new product range, an example scene was created which included example applications for each drive in the range. The user could explore each part of the process, view the drive which was controlling a particular stage and bring up key specifications. Used as a sales tool, and as a way of clearly making sense of a large but specifically targetted product range.